You'll never have to worry about streaks or off odors on your fine glassware again. At last an innovative product that will revolutionize the way you clean your glasses. New and exclusive Stem Shine represents state-of-the-art technology for glass cleaning. Replace clouds with clarity. You'll never have to worry about streaks or off odors on your fine glassware again. At last an innovative product that will revolutionize the way you clean your glasses. 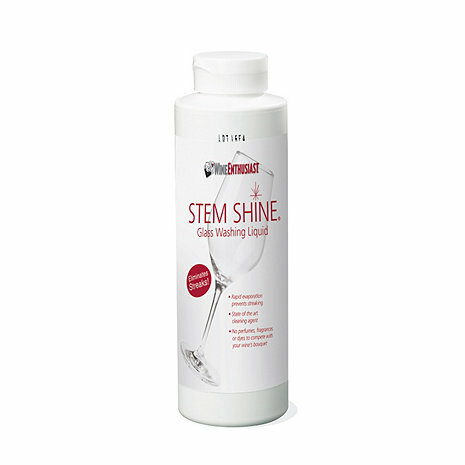 New and exclusive Stem Shine represents state-of-the-art technology for glass cleaning. Stem Shine doesn't just clean your glassware, it purifies it. Its cleaning agents go into the pores of fine crystal or other glassware and remove every trace of soil and contaminants. Stem Shine then evaporates quickly preventing streaks and completely removing odors that could compete with your fine wine's bouquet. Available for both dishwasher and hand washing use. how do you use stem shine? Do you put in directly into the glass or in water? I use it by filling up the sink, as if using dish soap, and then using a wine glass brush to clean it inside and out. This product is available for both hand or machine washing, but the pictured item is the hand washing variant. I have used the powder form of Stem Shine for years. Looks like you are not making it any more. Can the liquid product be used for a commercial hobart glasswasher. one load is 20 glasses? BEST ANSWER: The Stem Shine Wine Glass Cleaning Liquid For Hand Washing (16 oz) is best used for hand washing glasses. I am not too sure how well a liquid washing agent will work in a commercial dishwasher. BEST ANSWER: The Stem Shine Wine Glass Cleaning Liquid for Hand Washing (16oz) ONLY comes in the liquid form. Currently, there are no plans for Stem Shine to come in a powdered form. I have been using the Stem Shine Dish Washing Powder, 4 lb. carton, for years. I even sold it in the wine shop I owned. The question is not whether there are plans to start making it that way. The question is when will it become available AGAIN. The Best Cleaning product around!!! The powdered dishwasher version of this product is also excellent. I use it when I have a large number of glasses to clean after a party. For a few glasses, I use the liquid. It is quick, thorough and there is always a great outcome. My wine decanter has never been so clean! I mixed a small amount of cleaner with water in the decanter, let sit 5 minutes and rinsed. The decanter brush helped with a residual stain. The glass sparkled! I wish I would've purchased Stem Shine a long time ago. Love this product when cleaning wine glasses. It does not leave any film on the glass. Feel confident when serving fine wine to a guest that the glass will be sparkling. My wine glasses have never been cleaner. I had given up on ever getting the spots removed....they are gone! I have some in all my kitchens. Unlike regular dish liquid, Stem Shine works quickly and there is no residue on glass. This is my second order of this stemware cleaner and I ordered twice as much of it. I've bought stemware cleaner at the local wine shop and it doesn't hold a candle to this product for cleaning and giving a sparkling shine to crystal wine glasses. This cleaner makes a huge diffrence when it comes to cleaning fine glasses (Riedl). Can't compare it to any conventional cleaner. I use it for our wine glasses on a daily basis on my Riedel glasses, crystal and any clear glass. it's streak free! I have been using it for 10 + years and have never found any dish detergent to come close. I always have an extra bottle on hand. Stemware sparkles impeccably with this stuff. No residue is left behind, esp. when towel drying with well-used lint-free cotton or linen. A tiny bit goes a long way. This is a great product for cleaning stemware. It leaves no perfumy aromas or soapy taste, and leaves a great shine. No more trying to clean stemware with just hot water or rinsing forever to remove perfumy soap residue. Very effective for regular cleaning of wine glasses and decanters. Moderately effective for heavy red wine stains in bottom of decanters. I'll never use anything else to clean my wine glasses. This cleaner, using one tiny drop per glass, doesn't leave streaks or cloudiness. I'm hooked. Wow! Wine glasses in the dishwasher! Glasses don't spot when dried in the dishwasher. Not only did the wine glasses come out sparkling, old drinking glasses that had been fogged with use are now crystal clear! We have hard water, but this product still works well. I especially love the lack of perfumes. We think it leaves the glassware clearer than some other products and we plan to test the dishwasher soap further. We have used it on regular loads so far with good results even for silverware. I would like to recommend this item from Wine Enthusiast but don't feel your pricing is in line with what others are charging online. In a day and age with easy internet searches you need to not charge double and then shipping too. Sorry I have purchased this in the past but my new review here on this web site is to not buy this product. My wife likes the lack of residue from this cleaning liquid and feels that it makes crystal really shine. New meaning to "crystal clear"
Cannot stand water-marked glasses!! This product makes washing my finer glassware a breeze and allows my set table--and my hostess persona--to sparkle! I use this cleaner on my wine glasses & they never come out streaky or cloudy. Always re-order when I run out. The stuff does a great job getting wine glasses sparkling clean and clear. It is nice to able to see your wine in its true colors! I love this product because I can have sparkeling wine glasses without working too hard. This stuff works incredably well! The stem shine cleans glass really well. I would recommend it for folks that use decanters, and fine wine glasses. Just takes a drop and quick wipe and rinse and the wine glass is sparkling. Last forever. Love the product. If I could give it six starts I would. I struggled for years trying to get my wine glasses sparkling clean without the smear. I don't know what's in this but it WORKS. I use it now on all glassware, even glass lids for my pots. A little goes a long way. Worth every penny if you are particular about glassware. Tip: I poured it into a squeeze bottle for more control over the amount used. Prompt shipment and ample packaging. Delivery was prompt in good condition. However, with no local outlets the shipping cost gives pause as to whether to continue its use. This is a fabulous product!! I have been using this product for years. It's the absolute best!! The best wine glass cleaner ever! Make sure to use the right tool to clean the glasses not a simple sponge but long handled brush designed to clean glasses. The bottle should have been wrapped in plastic to keep the contents from spilling out into the shipper. The bottle was saturated and the label is now all smeared. In the future you should take precautions by putting it in a plastic bag or wrap plastic around it and tape it. I cannot be without this product. My glasses always look perfect. Simple to use for all methods of hand wash washing. A little of the product goes a long way. The glasses feel very clean. Best to use a very soft natural cotton towel for drying. My glassware has never been this bright! Totally spotless and clear. This is the best cleaner I've used. My glasses have never been cleaner. a splash on a wine brush cleans glasses without film on the glasses. Stem Shine is great on all of our fine crystal, especially Reidel glassware. It doesn't leave an odor, film or spots. I've been using it for years and won't use anything else on my wine glasses. It only takes a small amount in a bowl of hot water to wash lots of glassware. Rinse with hot water then watch them dry crystal clear, no hand-drying necessary! This is the ultimate in glassware shine! This is by far the best glassware cleaner on the market. It has no odor, doesn't leave a film and produces a great shine on all of my stemware. There is no downside to this product. I have been using it for years and have yet to find anything comparable. The majority of the time this product arrives having leaked all over. Luckily it comes in a plastic wrap. I have called your company each time to notify you of this problem. One operator was very helpful and actually sent me a replacement bottle free of charge. The others couldn't have cared less! BTW, I wasn't looking for free products, I just wanted to alert you so that perhaps you could rethink and improve your packaging! I have been curious about this product and decided to give it a whirl. While it doesn't give you any guidelines how much to use it does suds up and amazes me how the suds disappears when it hit the sink full of rinse water. The water sheets off and my crystal and even glass sparkles.